Suhail M. Ghouse is an Assistant Professor of Management & Marketing at the College of Commerce & Business Administration, Dhofar University. His areas of expertise include export promotion & internationalization, entrepreneurship, consumer behavior, digital marketing, etc. Suhail’s research focuses on export promotion & internationalization in the born global SMEs, mainly in an emerging economy context. He has previously tried to explore the existing barriers and problems which acts as a barrier to export performance. He has also researched on areas like outward foreign direct investment from emerging economies like India and China and the consumer usage patterns of the digital marketing in the GCC countries. His current research focuses on export promotion, rural female entrepreneurship, entrepreneurial behavior of GCC students & online shopping behavior for international products. 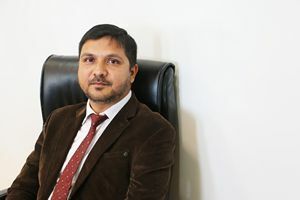 Suhail began his career after doing Master of International Business Management (MIBM) from Aligarh Muslim University in Export Marketing for one year after which he shifted into academics and obtained his Ph.D. in Management from Bundelkhand University. He has worked as a Lecturer and Assistant Professor of International Business & Marketing in India, Kingdom of Saudi Arabia and currently in Oman. He is a member of Academy of International Business (AIB), Marketing Science Institute (MSI) and All India Management Association (AIMA), and serves on the editorial/review boards of Inderscience and Emerald research journals. Suhail has been an active member of various university and college level committees as a part of community services. He is a member of Industry Engagement Committee which is a university level committee which encourages academic-research-industry participation. He is also a member of College Examination Committee and the Marketing & Publicity Committee. Suhail is affiliated to various international academic & professional organizations like Academy of International Business (AIB)-USA, Marketing Science Institute (MSI)-USA, etc. Suhail serves to the editorial/review boards of various leading indexed journals like Journal of American Academic Research, USA, International Journal of Management Practice, Inderscience, International Journal of Emerging Markets-Emerald, Review of International Business & Strategy-Emerald, etc. He is also an active reviewer to various international conferences like AIB 2017 Dubai Conference, USA, AIB UK&I-University of Reading Conference 2017, U.K., ICIM 2016-University of Hertfordshire, UK, etc. Suhail’s teaching is marked by a combination of theory, relevance and application. His focus on interactive teaching encourages classroom debate, understanding that often the best decisions derive from the conflict between differing ideas. He used case studies, narratives, articles and class exercises to help the students understand the concept and to develop cognitive and affective approach in the students about the subject. Where possible, he encourages action learning that will allow students to gain feedback from both their peers and experienced managers of the industry. Suhail teaches the courses of Management and Marketing in Dhofar University, especially focusing on the course of International Management. He has a wide experience in teaching the courses of International Marketing, Consumer Behavior, Principles of Marketing, Sales Management, Organizational Behavior, etc. in India and the GCC countries. He has developed the courses and teaching materials for the courses of International Business, International Marketing, Principles of Marketing and Consumer Behavior. He has supervised students at the undergraduate and graduate levels to the final projects/dissertations. He has also evaluated several PhD. theses as an external expert in Management and Marketing areas for different government universities of India.